Having gone out on disability several years ago, I began taking photographs as a way of not just keeping some semblance of mental acuity but also because I have always loved taking pictures. Because of some of the treatment regimens I have been on, I have a tendency to not have very good balance if I have to stand in one place for long stretches of time and sometimes I fall. That, and I also have a slight shakiness in my hands as a result of another treatment regimen. I say all this as backdrop to my hummingbird photos. I don't photograph hummingbirds at feeders but instead only shoot them in local parks and gardens and when I am out and about the city. And with all the sort of residual physical limitations/challenges that are a sort of mainstay with me, I have discovered that I can take pretty good hummingbird shots. The irony of the situation is not lost on me. 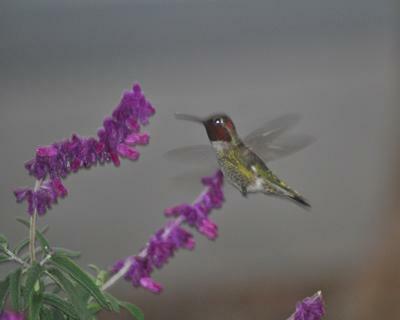 My friends joke with me that I must be a hummingbird whisperer or that I was a hummingbird in a former life. I can spot them when no one else can and seem to sort of intuitively "get" them. Beautiful little creatures aren't they? Thank you for sharing your story. Beautiful! I love these dainty little birds. Thanks for the opportunity to see this. A hummingbird whisperer you are indeed.Thank you for submitting this beautiful photo. You are a talented photographer. It is a privilege to share your work with our visitors.